The Part 11 Toolkit provides password protection to all databases to which it is applied. Each user ID must have its own password. 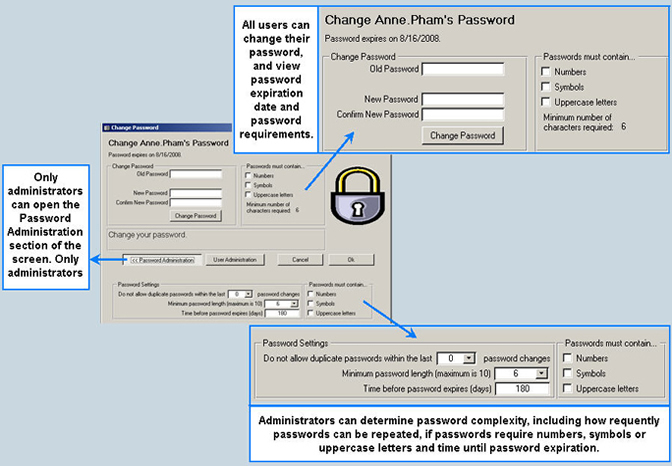 All users can change their own password and view the requirements for passwords. 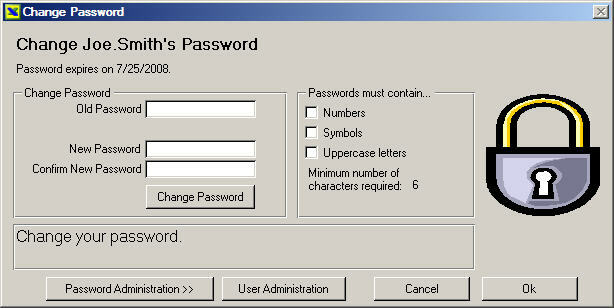 System administrators can update the frequency with which a password may be reused, how frequently passwords expire, and if passwords require numbers, symbols, or uppercase letters. All users must provide their user ID and password to log onto the system. The database records all successful system log-ons. Passwords must be entered twice to be changed. System Administrators can also open the User Administration screen to manage group security. Group Security is an element of demonstrating compliance with 21 CFR 11.10(d), Limited System Access, and 21 CFR 11.10(g), Authority Checks.